"All the Stories is an amazing app. You sign in, allow access to your family, and a list of all the stories anyone has posted on your family tree comes up. It’s as user friendly as anything I’ve seen: easy to access, no setup, instant results, and the results are important." At the top of the page it said "Price: Free" which is good. Current Version : 1.0 Last Update : February 16, 2016"
"Welcome to All the Stories! 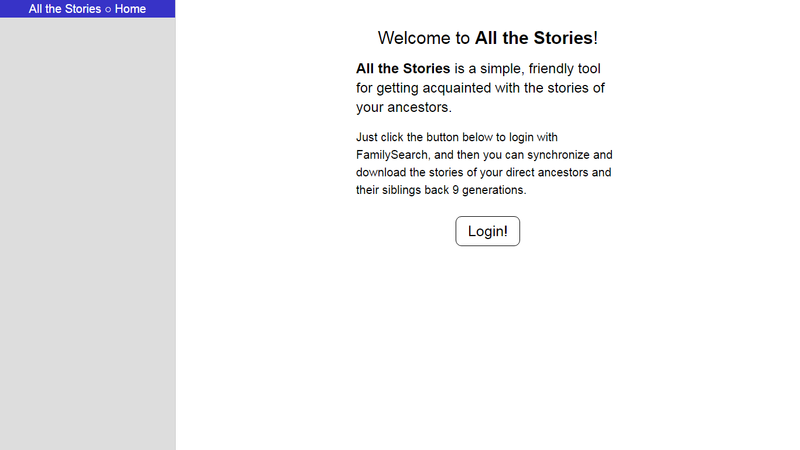 "All the Stories is a simple, friendly tool for getting acquainted with the stories of your ancestors. "Just click the button below to login with FamilySearch, and then you can synchronize and download the stories of your direct ancestors and their siblings back 9 generations." I clicked "Login" and went through the FamilySearch sign-in process. As the program found stories attached to persons in my ancestral families, it listed them on the left-hand side of the screen above. It took about three minutes to go through the nine generations of ancestral families - on the screen above it is on William Whitmore Cutter, the 483rd person searched so far. I think it worked through about 700 persons. When the program finished, I had a list of 16 "Stories" on FamilySearch for the persons in my FamilySearch Family Tree. The screen above provides the story, and information about the person, including the relationship to me, with a definition of the line from the person to me. 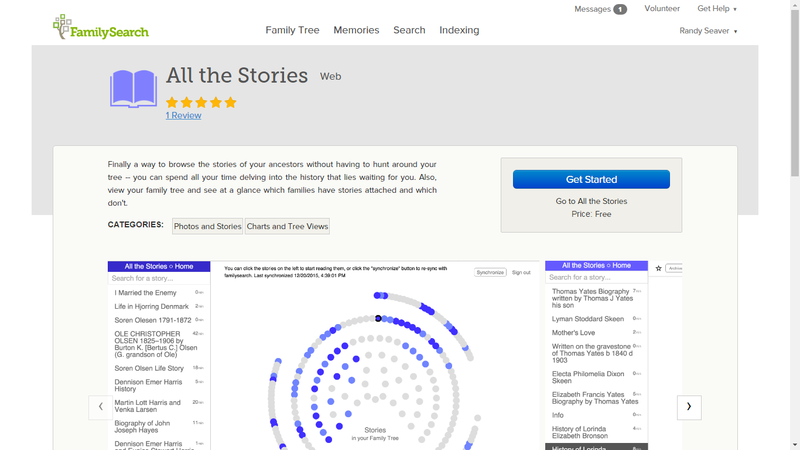 I think that the graphic with the blue dots on the screen with the list of stories shows the persons in my family tree with a story, with the mother's "dots" on the right and the father's "dots" on the left. 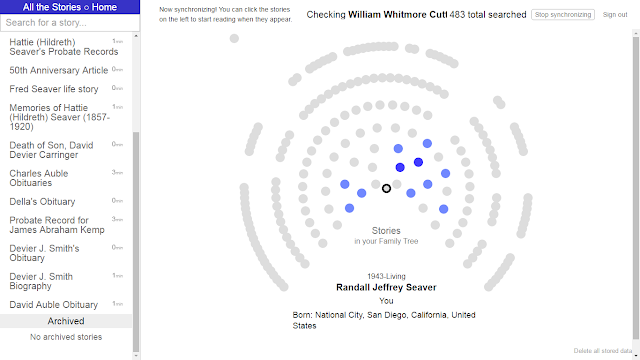 I have uploaded only a few semi-random stories to the FamilySearch Family Tree. I guess I should do more. I have added Life Sketches and Person Notes for many of my ancestors, but few real "Stories." The Life Sketches and Person notes are not available with this app, only the "Stories" in the "Memories" section of the FamlySearch Family Tree are available. I came back in later in the day, and clicked the "Synchronize" button on the top line of the "blue dot" screen above, and it ran through the process again, telling me the latest time I updated the results. After seeing several of these stories, I went back and edited several of them. The changes were not reflected on the app the next time I synchronized the app with the Family Tree. As the site points out, the site has not been updated since February 16, 2016. That's why my changes were not reflected. * This is a pretty useful app, but only if persons using the FamilySearch Family Tree submit "Stories" to the "Memories" section about their ancestral families. * I'm the only one who has submitted "Stories" for my ancestral families to date. * I need to submit more stories, and go to earlier generations if possible. 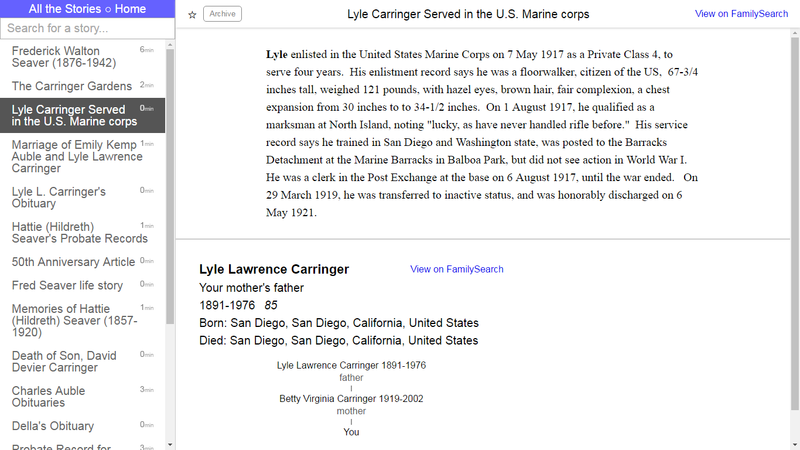 * Other researchers need to submit "Stories" also to the "Memories" section of the FamilySearch Family Tree person profiles. * The "All My Stories" app needs to update their process more often than every two or three months. Ideally, every day would be best. That is a compiler that many will enjoy using. I hope they will not extend the program to photos. Many of us will not enjoy copyright-violating uploads of gravestone photos, and the cartoons of ships and completely inapplicable invented coats-of-arms, perhaps salted here and there with interesting person-photos. Does anyone know how to contact Glen, the author of "All the stories" app? I RALLY LIKE YOUR WORK, KEEP DOING THAT BEST OF LUCK.